This post, the first of a series, relates to research carried out at Don Chao Poo Forest, Phana, between January and April 2012. When habitat destruction occurs, there is bound to be an increase in interactions between humans and other species. A species that seems to thrive in fragmented habitats is the long-tailed macaque Macaca fascicularis). This species of monkey is often found at tourist attractions, and can be quite aggressive in its pursuit of food, or getting things of interest from people. 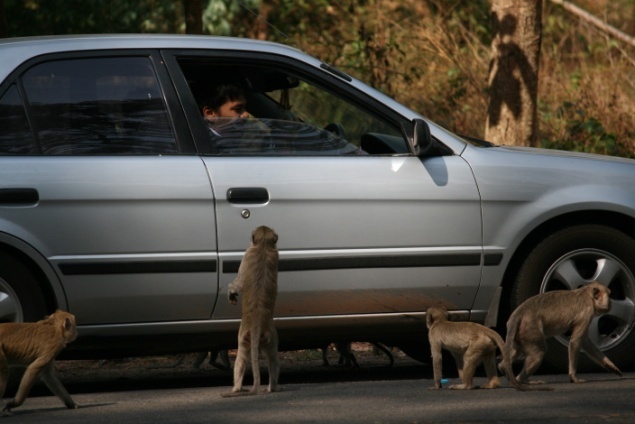 These aggressive interactions can be caused by habituation of the monkeys to humans due to provisioning. When humans and other species clash there can be detrimental effects, such as the spread of disease (zoonosis), injuries, and loss of crops. When my colleagues and I (four researchers who have recently completed our master’s degrees in animal behaviour at the University of Exeter) were invited to the north-east region of Thailand to carry out some research on a population of previously unstudied long-tailed macaques, as well as aiding in the set-up of a research centre, we jumped at the chance. The population was in a sacred forest (Don Chao Poo Forest), in the Phana district of Amnat Charoen Province. 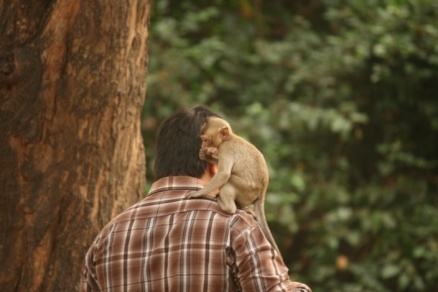 This population is unique in some ways as although the monkeys were habituated to humans, it was rare to have adverse interactions. 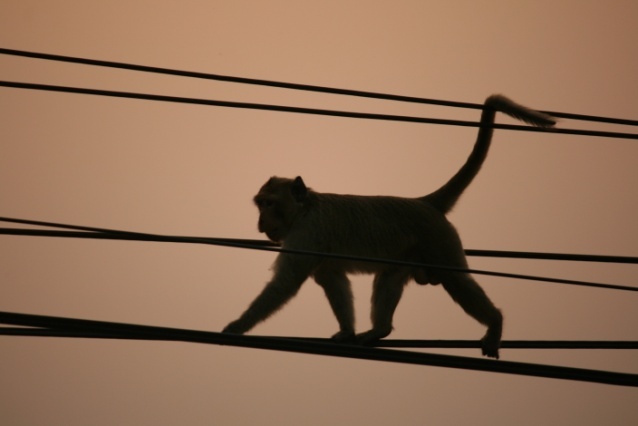 In recent times the monkeys had been seen to be moving into town more frequently on the hunt for food, and they had been reported to be stealing from local shops. One of the aims of the project is to carry out research that could be used to aid the creation of action plans to prevent undesirable exchanges occurring in the future. We are hoping that with a greater comprehension of where the monkeys were going, what they were doing, and of the interactions that they were having with people we would be able to contribute to not only the creation of a new research centre, but to the maintenance of a non-aggressive population of long-tailed macaques that the villagers could learn from and gain a greater respect for. We are eager to change the attitudes of some people that see this species as a pest, through education via the new research centre that is being launched. Now that we have arrived in Thailand and spent some time getting to know the place and the monkeys, we have set ourselves a number of targets that we hope to achieve during our time here. We hope to be able to complete the following: Population census; mapping the forest; phase 1 habitat survey; butterfly biodiversity study; ad-libitum sampling to create a comprehensive ethogram and a basic ethogram for the usage of by future researchers; time budget analysis; nearest neighbour analysis. Our first tasks will be to get used to the forest and the monkeys, to find out how many monkeys there are, where they tend to spend their time and what sort of groups they are in. Once we have established when they get up and go to sleep and where, we will be able to establish an effective timetable for carrying out our research. Over the next three months I am hoping to be able to keep you updated on our progress in the field, how successfully our research is going, anything exciting we might stumble upon, and any problems that we might encounter along the way. 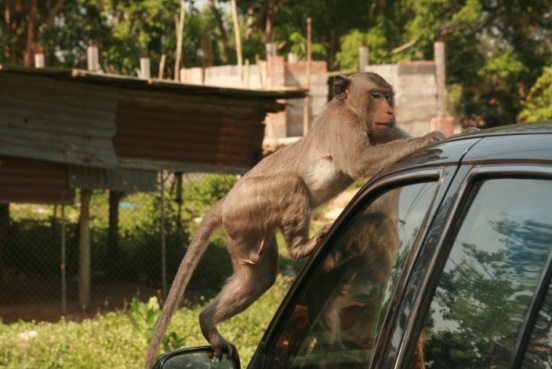 This entry was posted in Amnat Charoen Province, Macaca Fascicularis, Macaques, monkey forest, Monkeys, Research and tagged Amnat Charoen Province, Don Chao Poo Forest Phana, Long-tailed Macaques, Macaca Fascicularis, monkey forest, Phana Municipality, primate research, Thai monkeys. Bookmark the permalink.